Samuel Gorton is a 9 th great-grandfather of Doyle Davidson on his mother's side. His exact birth date is not known but it is believed it was around 1592, in the town of Gorton, England. He wrote, "I was born in the town of Gorton, old England, where not only I but also were the fathers of my body for many generations." Family historians write that Samuel's father Thomas was a husbandman (a tenant farmer) and possibly involved in other trades. Other historians believe he was a merchant trader, so it could have been both, as was suggested. It is believed Samuel was apprenticed as a clothier in Manchester around the age of nineteen and that he didn't leave home until the age of 25 or 30. He married Mary Maplet sometime before 1630 and at this time he was well established in the clothing trade. An interesting note about his wife Mary was she could read and write, which was unusual for a woman in those times. She came from a well known, affluent family. Her grandfather, John Maplett was a distinguished clergyman. Her father John was a haberdasher (merchant in men's clothing), a trade similar to Samuel's and may be how they met. One could surmise that raised in such a genteel environment, Mary must have been a woman of character, strength and courage to have survived the challenging life she had with her husband. They eventually had nine surviving children, and most of those were born under very difficult frontier conditions. Samuel was not formally educated at any of the celebrated colleges of England and he wrote, "I was not bred up in the schools of human learning; and I bless God that I never was". He was instructed by tutors and received a classical education from them. Being studious, he became an accomplished scholar, more than ordinarily skilled in the languages and learned English law. He was raised in the Church of England, commenting on this fact in his writings. On one particular record of him while he resided in London he is described as "Samuell Gorton, clothier" and also as "Professor of the ministries of Christ." He and his younger brother Thomas, Jr. and their families joined those migrating to America in 1636. "He yearned," he writes, "for a country where he could be free to worship God according to what the Bible taught him, as God enabled him to understand it". He was accused of leaving London because of an unpaid debt, which he denied in writing, "I left my native country to enjoy the liberty of conscience in respect to faith towards God, and no other end." Upon arriving in Boston, he and others like him found the new rulers had established over that colony, a new church government as strict and severe as the one they had left in England. 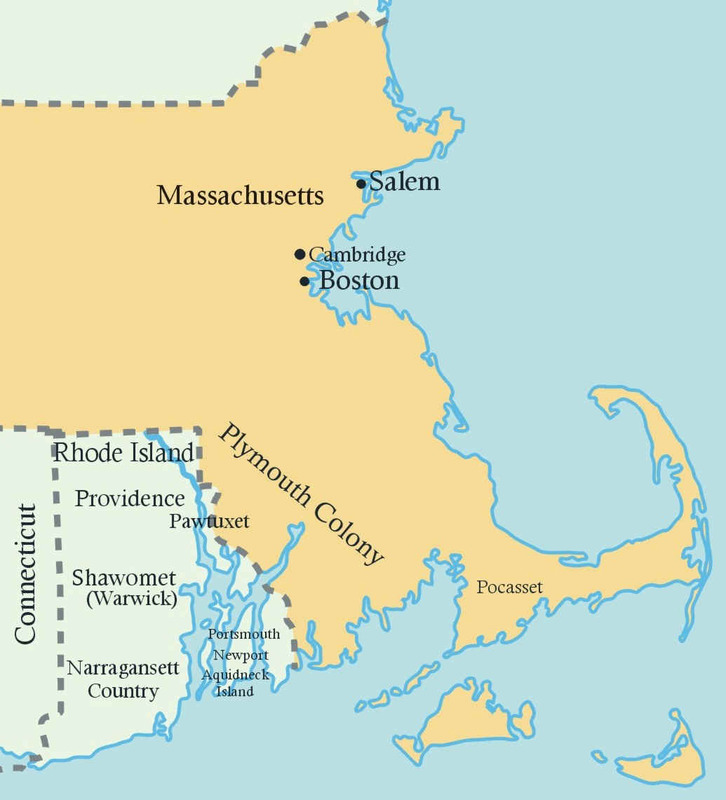 The Massachusetts colony was Puritan. Those who didn't agree with the governing authorities lost all privileges as a citizen, to vote or own land. The freeman's oath had been changed from the government of King Charles and was now to the government of Massachusetts. Magistrates were empowered to fine or imprison all persons that didn't attend their church meetings, and no one could be admitted to the freedom of the commonwealth who gathered in any other church meeting; no one could inhabit the colony without being examined and licensed by the magistrates and anyone who settled in violation of these laws were commanded to leave. The orders were enforced with severe penalties. "He discovered that the liberty which he sought was not here; that the practice here was far short of the profession as he understood it, and the liberty which they practiced was only a liberty for themselves and not for their other fellow Christians". Within about two months from the time of his landing he took up his residence in Plymouth, intending to make that his home. The Plymouth government was somewhat more liberal than Massachusetts colony. The Pilgrims did not require of the settlers that strict conformity to their church as Massachusetts did. Their freeman's oath was to King Charles; their governor was chosen directly by all the freemen, and they recognized the franchise rights of nearly all settlers. At the time of Gorton's arrival in Plymouth, the annual election was soon to take place. The church party was pushing for the same government that Massachusetts had. Many citizens were quite alarmed because Massachusetts had a representative government which made all the decisions, and they feared citizenship would be granted only to a few strictly qualified church members. The church party prevailed but Gorton had become the most determined leader of the people in opposition to the church system. He and his family faithfully attended the regular church services, but he also held meetings in his home for the instruction of his family and others began attending, which offended some in the community. A widow who he had employed as a housekeeper was accused of smiling in church, and Gorton went to court to defend her in her place. When he arrived with the information to show that the offense was not recognized in English law, he was charged with deluding the court because he kept his housekeeper from coming. He had to return to court to defend himself for defending her. The sixteen men that the court depended on for the trial and orderly proceeding, in Gorton's defense, voiced their disapproval by not being present. They were all fined. "The magistrates" Gorton asserted, " should not be made parties and judges; the place of a persecutor was not in the judges seat, but "down where a persecutor should stand;" and he called the people to witness how their liberties were abused. He was "sentenced to depart from Plymouth, his home, his hired house, his wife and children, and to be beyond the utmost bounds of it within fourteen days." It was during winter, one of the most severe recorded in which many colonists were frozen and perished. He walked to Aquidneck Island to Pocasset, which was the first settlement on that island. Gorton again became entangled in disputes with the local governing authorities, which had been set up much like the one they had left in Massachusetts. His objections were that those who administered it observed not the laws of England, of whom they were subjects, nor the rights they provided for her subjects, that they had received no grant of sovereignty from her, nor were they ruling by the permission of a majority of the people, but had set themselves up as rulers and were governing by their own interpretations of laws from the Bible. Gorton was a student of the law. His library that he brought with him from England contained the standard authorities, and he understood his own and the people's rights better than did the judges and elders. With Gorton leading the group, they ousted the ruling government and set up one under English law. It was the first government in the colony, organized like our government today. They were then under a compact which swept away the whole Puritan policy. It was a model government. They changed the name of the town to Portsmouth, and they held regular meetings monthly. But there were those who resented the interference and found a way to accuse Gorton. The same snare that had been used in Plymouth was set up at Portsmouth, again using Gorton's servant. Gorton went to her aid and ended up in court himself. He protested against the unfairness and illegality of the proceedings and ended up being publicly whipped, according to an eye witness account. Gorton and others who were leaders of his party (some of who were the original purchasers of Aquidneck) abandoned the island and went to Providence. Before Gorton arrived in Providence the people there had been engaged in land disputes for about three years. Roger Williams' land grant was divided into two parts, the whole of it being called "The Grand Purchase of Providence" and the west part "the Pawtuxet purchase." William Arnold and his son Benedict Arnold (great-great grandfather of the traitor, Benedict Arnold), son-in-law William Carpenter and Robert Cole claimed the Pawtuxet purchase, and they did not allow newcomers in their settlement to be landholders. There was an on-going dispute between Providence and Pawtuxet. When Gorton and his friends settled in, they had no personal difficulties with anyone. Not wanting to be drawn into the dispute, they withdrew from the early settled portion of Providence and purchased a claim from Robert Cole. During the fall and winter of 1641 and 1642, Gorton and his five associates from Portsmouth, plus two from Providence, built houses and worked to provide for their families. The Pawtuxet group was not pleased and considered they were illegal settlers. Benedict Arnold wrote a complaint about one of the settlers' cattle, signed it along with a small number who were in agreement with him, and headed it as a "petition of the people of Providence", which was not true. It was unofficial and unknown at the time to the whole of Providence and only represented the petitioners. He sent it to the Massachusetts magistrates who advised them to put themselves under jurisdiction, "and then we would have a calling to protect them". This petition initiated the Massachusetts Bay colony extending its jurisdiction beyond its chartered limits. Gorton and his friends regarded this as a flagrant act of usurpation. The Arnolds and their group stirred up a controversy that lasted sixteen years. The Massachusetts colony not only wanted to bring that area under their control, but they also wanted to stamp out what they considered to be heretical doctrine of the Rhode Island settlers, and this gave them the means to do so. All the Pawtuxet settlers were notified that any disputes among them would be settled by the courts at Boston. William Arnold delivered the warrant to the people as one of Boston's newly accredited officers. Massachusetts colony then sent him along with other officers to Miantinomi, the Grand Sachem of the Narragansetts Indians to demand he come to Boston, deny the sale of land he had made to Roger Williams and submit himself, his tribe and their lands to Massachusetts. He appeared, but would not deny his sale to his friends at Providence, defended his rights and refused to submit anything to Massachusetts; thereon, the court forbade him to sell land without permission and ordered the disarmament of his people. One of Gorton's friends who had moved to a Dutch colony encouraged Gorton to come there. Gorton thanked him but told him he could not be subject to a "foreign prince". Gorton and eleven other men purchased Shawomet December 1642 from Miantinomi determining to settle far enough from the other settlements to be out from under Massachusetts' jurisdiction. This stirred up Massachusetts further, that Miantinomi disregarded their orders and sold land to the "heretics". The little band of settlers were brought face to face with all the power of the larger colony. Gorton and his colleagues now had to choose between civil liberty and bowing down to this arbitrary power and going into their courts to be tried and judged and maybe punished. They chose the first. They addressed the court with a letter and two statements stand out: ...."But the God of vengeance unto whom our cause is referred, never having our protector and judge to seek, will show himself in our deliverance out of the hands of you all..........."We will not be dealt with as before we speak; in the name of our God, we will not; for if any shall disturb as above, secret hypocrites shall become open tyrants and their laws appear to be nothing else but mere lusts in the eyes of the world," and they concluded, "Countrymen, (we can but call you so), though we find your carriage to be far worse than these Indians." After Massachusetts had asserted her claim it became evident to other settlers that their independence, their only guarantee of rights of religious freedom, could not be maintained without a charter. They acknowledged Gorton's theory of security and a stable government and joined in petitioning the English government for a charter for government. The people chose Roger Williams in February of 1642-3 "to seek this favor and protection from the mother country." The group at Portsmouth had already sent a committee to secure a patent for Aquidneck Island (which included Portsmouth and Newport), and Massachusetts had two agents in England making efforts to secure a patent for the Narrangansett territory, including Providence, Shawomet and Aquidneck Island. Williams' departure was just in time to prevent it being patented to others. At this time, the colonies of Massachusetts, New Haven and Connecticut made an alliance, termed a United offensive league and defensive league against heretics and the Indian tribes who would not submit to their governments, Plymouth being brought into the alliance later. Miantinomi again was solicited to go to Massachusetts, and even when threatened that the sale of land to Gorton and his partners should cost Miantinomi his head, the Sachem would not denounce his loyalty to his Rhode Island friends. It wasn't long after this that he was captured and killed by the rival Mohegan Sachem, Uncas, at the instigation of the Massachusetts colony. Massachusetts then seduced two sub-sachems under Miantinomi's rule to bring their areas under Massachusetts' jurisdiction. This was brought about by the Arnolds, who had been selling those Indians arms and gunpowder in the past. After numerous threatening notices to the Providence and Shawomet settlements and their replies to not comply with their demands, forty soldiers under the command of Captain Cook, Lieutenant Atherton and Edward Johnson were dispatched to Providence. The women and children fled from Shawomet, into the woods, Gorton's wife being one of those. The wives of John Greene and Robert Potter died from exposure in their flight. The men fortified one of the homes and prepared for a siege. The soldiers ransacked their homes and seized all their cattle, (which they turned over to Arnold). The soldiers were four times in number of the settlers and besieged them many days. The settlers did not fire one shot, not wanting to harm their countrymen. Seeing that they would have to yield, the settlers agreed to accompany the officers to Massachusetts, provided they might go as "free men and neighbors." They were seized and marched through all the towns on the way to Boston. The arrested men were Samuel Gorton, Randall Holden, John Wickes, Richard Carder, Sampson Shotten, Robert Potter, John Warner, William Waddel and Francis Weston. Richard Waterman and Nicholas Powell also surrendered themselves and appeared at the trial of the rest of them. (John Greene and two others escaped). The only complaints registered against these men, were by the ministers and magistrates. The trial went on for weeks. The men were condemned as blasphemous enemies of the Lord Jesus and were sentenced and imprisoned, barely escaping the penalty of death by the refusal of the people to agree in the judgment of the elders. They were all sentenced to be confined to hard labor, in irons in different towns, Gorton at Charleston, the entire winter. They were eventually set at liberty because the general public did not approve, and it was public opinion that brought about their release. Francis Weston died from the hard conditions. They were banished from all Massachusetts' jurisdiction, which they considered extended to Shawomet as well. When Gorton and his companions returned to the island, the Indians welcomed them with great joy. Gorton, because of his treatment of the Indians, his treatment of Miantinomi, (whom had been captured and killed by Uncas of the Mohegans despite Gorton's pleas for his release), he had the highest favor with the Indians that any white man had ever had. They sought Gorton's council and submitted themselves and their dominion to the King of England. In this one act, this little band of men thwarted what Massachusetts colony thought was their final conquest of the Rhode Island area. Samuel Gorton, John Greene and Randall Holden, having no other recourse, due to the continual harassment of Massachusetts, left for England in 1644 to "to preserve to souls and the liberties of the people." They took with them the papers of the Narangansett Indians' submission to the government and King of England. Roger Williams had returned that same year with a charter for Providence Plantation, which included the towns of Providence, Portsmouth and Newport. Shawomet hadn't been settled at the time Williams had left for England. Gorton spent four years in England to secure a patent and protection from the harassment of Massachusetts colony. His petition was later titled and published as "Simplicities Defence against Seven-Headed Policy." Massachusetts sent Edward Winslow to England to defend their petition. John Winthrop (who became governor of Massachusetts) wrote that upon Winslow's arrival in England, he had a day appointed for an audience before the Earl of Warwick and the Commissioners of Plantations to state their case. Winslow had great advantages in business through his assistant Massachusetts agents and counselors and official friends, and was described as a "Hercules". Gorton, unaided and almost alone, had the "herculean talk". Added to the Massachusetts array of influence and talent against him was the claim that came from the committee from Aquidneck Island and the other opponents of the charter, the Arnolds. In but few instances did man ever defend a cause so successfully against such an avalanche of assailants and assaults, having such unfair advantage of him. Gorton's friendship with the Earl of Warwick was a positive influence in the case for the Providence Plantations. The result of the trial was the refusal by the Parliament Commissioner to Winslow of every one of his requests and the granting of those of Gorton. They also issued a second letter to Massachusetts, admonishing them to confine their jurisdiction to within the limits of their sole patent. An interesting note: During this time, Massachusetts colony was a favorite of Cromwell (head of England) and they had favor that no other colony had, one of those being exclusive control of the only printing press, which was at Cambridge. *1 Many things had been written, published and distributed in the colonies and also in England, about Samuel Gorton. They sought to discredit him, going so far as to attack his character with false statements before he ever arrived in England to defend the cause of the Providence Plantations. One historian is quoted as saying: the government that had originally been formed on Aquidneck Island by Gorton/Hutchison and associates at Portsmouth "operated like leaven in diffusing itself through the minds of the masses and formed the nucleus out of which ultimately sprang the Declaration of Independence." At the close of the government code appears these words: "These are the laws that concern all men, and these are the penalties for the transgression thereof, which by common consent are ratified and adopted throughout the whole colony; and otherwise than thus what is here in forbidden , all men may walk as their consciences persuade them, everyone in the name of God; and let the saints of the Most High walk in the colony without molestation, in the name of Jehovah their God, forever and amen." The Rhode Island group continued to have difficulties with their Massachusetts neighbors and the Coddington/Arnold group, but the small group of men continued to guide the "State" through every hurdle. These men gave their lives to serve the people, to see come to fruition a government of civil liberties and freedom for all people. They believed the government should concern itself with civil affairs and had no business dictating how men should believe. They abolished life servitude, and it is the only legal enactment abolishing slavery that was passed in those early times in any of the colonies. They were a refuge for all those banished from the Puritan colonies for their religious beliefs. As stated, Samuel Gorton was a figure much maligned by early writers. Gorton's enemies had years to spread their opinions of this man and his teachings through the written word, because they controlled the "press". *2 A press controlled by the government is very dangerous and a threat to the very freedom of a nation. Adelos Gorton writes: "I have read almost every word that is legible of the records of the colony from its first settlement till after the death of Gorton. From the first establishment of the government he was almost constantly in office, and during a long life there is no instance of record to my knowledge of any reproach or censure cast upon him, no complaint against him, though history furnishes abundance of evidence that there was no lack of enemies to his person, principles or property. This can hardly be said of any other settler in the colony of any standing....the whole tenor of his life shows that he was conscientious, sincere and in all matter of fact, honest and truthful. The community in the midst of which he lived, trusted and honored him to the last, and few testimonials to integrity of character are better than this. It is a remarkable circumstance that he always retained the affection of his neighbors and friends. He was their chosen representative to the Assembly in the years, 1649, 51, 52, 55, 56, 57, 58, 59, 60, 62, 63, 64, 65 and 66; served a number of terms in the Upper House, Corresponding to the present Senate; was Associate Judge of their highest court, and was their President or Governor from 1651-1652." Samuel Gorton died on December 10, 1677 at the age of eighty-five. The majority of these men that settled the area of Rhode Island separated from the Massachusetts and Plymouth colonies, either voluntarily or by banishment, because of their religious beliefs and commitment to liberty for all men. Samuel Gorton was a leader not only in civil affairs but also in spiritual matters. Gorton's writings speak of what he believed and practiced. He wrote and published: Simplicities's Defence , An Incorruptible Key, Composed of the CX Psalme, wherewith you may open the rest of the Holy Scriptures, Saltmarsh , The Common Plagues , and Antidote Against Pharasaical Teachings . He left an unpublished manuscript named A Commentary on the Lord's Prayer . Doyle has read much of the, An Incorruptible Key and has noted that Gorton had a brilliant mind and certainly had knowledge of the entire bible. He notes Gorton's statement, "..... If there be a righteousness before that whereby he is made righteous, it is not the righteousness of God by faith in Jesus Christ, he is yet in his sin. If there be a spirit before that by which he is illuminated, it is not the Spirit of God, received by the hearing of faith, but a spirit of delusion, arising from the works of the law." One who reads about the life and character of this man, Samuel Gorton, might see the parallels to the life of his descendant, Doyle Davidson. Samuel Gorton devoted his entire life in the new country to resisting those who purposed through civil authority to impose their religious beliefs on all who came. Gorton and others knew the only way to preserve freedom of worship was to have a separation of church and state, which to them meant that government had no right to dictate a person's beliefs. The authorities brought Gorton before the courts time after time, seeking to rid themselves of him, even to have him killed. God surely upheld him, each time making a way for him to escape. Wicked men not only desired to destroy Samuel Gorton and his associates, but overtake all the settlements of that area. If they had succeeded, a very different government would have been established. Any person who has followed Water of Life Ministries is aware of the persecution that has come against Doyle and his ministry. From the very beginning, religious leaders sought to discredit him, silence him or bring him into subjection. Despite the attacks, he was never moved from what he believed God had called him to do, nor did he allow them to rule him. Did not the press and the courts set out to destroy Doyle Davidson and his ministry in 2004? Yet they did not prevail. God ministered these words to Doyle in 1970, from 1Cor10:13, "There hath no temptation taken you but such as is common to man; but God is faithful, who will not suffer you to be tempted above that ye are able; but will with the temptation also make a way to escape, that ye may be able to bear it. " God has done that in every situation, because Doyle never stopped believing the gospel, which was performed on the cross at Calvary. "That all the principal facts belonging to the history of Samuel Gorton and his companions and the affairs with which they were associated, that are necessary to an understanding of them and a correct judgement regarding them, have never been given, alone, not with others, in one unbroken collection, and the desire expressed by many that these truths from every source should together shed their light upon these subjects, are the reason above others that have prompted their gathering and issuing in this volume." 1 The first printing press in the colonies was started in late 1638 at Cambridge, Massachusetts by the widow of Rev. Jose Glover and Stephen Daye whom Rev. Glover had hired from England. (Rev. Glover died on the voyage to New England). 2 Page 75 and the Intro. of The Life and Times of Samuel Gorton: They (Massachusetts) had exclusive control of the only printing press (that at Cambridge) in America for nearly twenty years, with licenses prohibiting the publication of any book or paper not approved by them. For want of a sufficient population, it was not until 1709 that a printing press could be maintained in Providence or the island.